It’s hard to think that it was nearly ten years ago when the world economy first went into a period of decline, its first major drop in years. During that time, thousands of jobs were lost while many more lives were ruined; and most of the public blame was directed towards the greed of the bankers who, through their naivety, kept making bad decisions that were only in their self-interest. Over the years, Hollywood has portrayed the greedy banker as one of its many stock villains, whether it’s in more traditional stories like It’s A Wonderful Life or anti-hero character studies as in The Wolf of Wall Street, and for the most part this has been an accepted public opinion on the money-driven executives of Wall Street and beyond. What may end up surprising everyone, however, is the fact that perhaps the most straight-forward, informative, satisfying and entertaining on-screen account of bankers and the financial crisis during the last decade, is being brought to us by the director of Anchorman. Adam McKay, also credited as co-writer with Charles Randolph, clearly has a fascination with the financial market as a whole – he even placed handy infographics about the system during the end credits of The Other Guys – and with The Big Short, based on the book of the same name by Moneyball and The Blind Side author Michael Lewis, he gets the chance to show off his knowledge and restricted enthusiasm of the system and its numerous personalities, in perhaps one of the more accessible films of its type. The film tells the true-ish story of a number of individuals who saw gaping holes in the supposedly-steady housing market, and decided to “short” (i.e “bet against”) the American economy. These people included the eccentric Michael Burry (Christian Bale), the endlessly aggravated Mark Baum (Steve Carell), the aggressively smug Jared Vennett (Ryan Gosling), and young business partners Charlie Geller (John Magaro) and Jamie Shipley (Finn Wittrock) who gain the help of retired banker Ben Rickert (Brad Pitt) to pave their own way in the cracking economy. All of these people would in some way highly profit off the eventual collapse, earning billions while the lives of many suffer the full-on effects of global economic crisis. Remarkably, it’s a film that doesn’t really have much of a hero, just bad people with more of a moral compass than many. Baum, for instance, becomes increasingly horrified when he gradually learns about how investors and banks are using faulty loans to build up the Jenga puzzle that is the economy (it’s worth pointing out that Gosling, as the fourth-wall breaking narrator, uses said Jenga puzzle and many other oddball devices to explain the complicated nature of the financial market to the audience, such as having Margot Robbie explain to us about sub-prime loans whilst sipping champagne in a bubble bath, because why not? ), and as a result becomes much more emotionally disconnected with the position he claims to love. Yet, he still goes along with the short to catch the banks with their trousers down, but in the process ends up making billions while everyone else suffers. By definition, he’s not a good guy (his temperamental overall attitude doesn’t help either), but his admirable realisation of the dire state that millions of people are about to find themselves in, including a heart-breaking final scene that is perfectly acted by Carell and directed by McKay, prevents him from being a Jordan Belfort-like monster as well. In fact, all the performances from Carell to Bale, Gosling et al are great here, whether they’re playing absurdist caricatures or noble attempts to humanise people we should morally not be humanising at all, but the star really is McKay’s unhinged direction here. It’s important that he has previously established himself as a satirist, whether it’s the male-dominated newsrooms of Anchorman or the buddy cop action flick as in The Other Guys, because this particular situation needs a more light-hearted pair of eyes to not only address it head-on but to also provide anyone watching it with a biting, sometimes hilarious, and always entertaining movie that they can understand and follow without getting lost in all the jargon. He pulls it off thanks to the script’s weird but undeniable sense of humour, as well as its fearless refusal to conform to the more traditional templates of telling stories like this, and although there are a few elements that threaten to hold him back (namely Barry Aykroyd’s zoom-in zoom-out cinematography and the rapid-fire editing), McKay nevertheless makes a healthy combination of narrative satire and Michael Moore documentary tricks to tell a powerful tale of corruption, greed and moral imbalance in the modern age. It will definitely put off some movie-goers with its hands-on approach to such a topic, but The Big Short will certainly capture the attention of anyone who wants a financial crisis movie they can understand and follow as they could any other mainstream film. And to think, the last film Adam McKay made saw Will Ferrell feed a baby shark with a milk bottle. 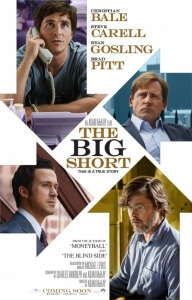 The Big Short is a wildly off-kilter approach to explaining the financial crisis of the last decade, but the choices that director Adam McKay makes throughout the course of it not only help his ensemble cast give great performances, but provides the audience with an entertaining, sometimes hilarious, satirical drama that makes the strangeness seem more than valid.